For centuries the argument has raged. Does size matter? Well, if you like great performance, power and copious amount of torque, the answer is a resounding no. At least in the world of diesel engines. Currently being tested on the roads of North America, the X12 is a massive 600LBS lighter than other medium bore engines and has been especially designed for weight sensitive applications and for vehicles where the X15 has more grunt that’s needed for the task. Despite being light weight the X12 delivers up to 500HP and a power to weight ratio of 1,700 lbs./ft, meaning what you lose in engine weight you can gain in maximum payload capacity without losing an ounce of performance. 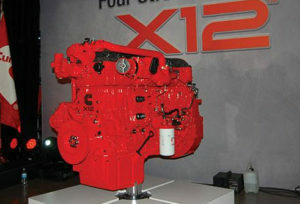 Cummins boast, with plenty of reason, that the X12 is ideal for growth markets, regional haul, intermodal and vocational applications. That it is the “Productivity champion, with industry-leading power-to-weight in performance and transient response”. It’s also “Fuel efficient from idle to interstate, through low-friction design”. Being a Cummins, you can also expect similar maintenance intervals enjoyed by its big brother, the X15. It’s also compatible with many transmissions and can be used in a fully automatic mode, AMT or manual. Each company holds a fifty-fifty stake and they’ve named the new company Eaton Cummins. Its aim is to design, assemble and market medium-and-heavy-duty automated transmissions for the commercial sector. The X12 is the result. Taylor gave the example of downspeeding as to why the relationship between Eaton and Cummins would bear fruit. Downspeeding is what you get when quicker axle ratios allow the engine to maintain a lower RPM without having to forego any power to the axle. This also benefits fuel consumption. One admirable trait of Cummins is to ensure that the longevity of their engines is so great that they retain their re-sale value. The development of powertrains is the de rigueur in the truck world media, with electric, hybrid and hydrogen the buzz words for the future of transport, yet good old-fashioned diesel, with all its negative press, remains at the forefront. But will that change, Mike was asked? And so are we Mike, so are we.